Learn what leaders focus on as they strive to improve distribution processes and improve customer interactions. 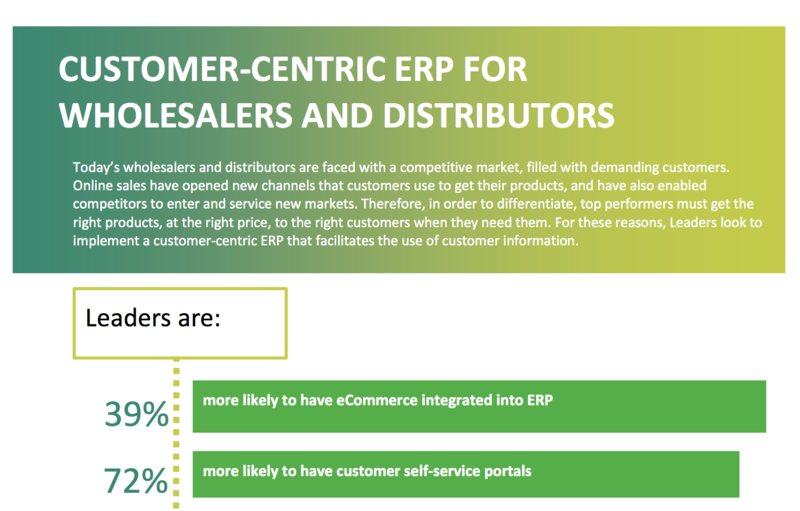 Customer-focused ERP may sound like an oxymoron, but for distribution firms looking to compete in a modern business environment, it is an imperative. As companies in the industry are finding new ways to reach customers, leaders are embracing more integration, focusing more heavily on customers, and implementing new solutions to get there. Today’s wholesalers and distributors are faced with a competitive market, filled with demanding customers. Online sales have opened new channels that customers use to get their products, and have also enabled competitors to enter and service new markets. Therefore, in order to differentiate, top performers must get the right products, at the right price, to the right customers when they need them. For these reasons, leaders look to implement a customer-centric ERP that facilitates the use of customer information.